Who has taken Superman beyond his limits and overcome the Man of Steel with relative ease? Zod? Luthor? Brainiac? No, the one man that proved to be more than a match for the Last Son of Krypton is the often ridiculed, yet unforgettable Nuclear Man. For that reason and that reason alone, my nomination for this month’s DC World Hall of Fame is the enigmatic, musclebound, goliath of a man, Mark Pillow! Mark Pillow was born on April 14, 1959 in Leeds, West Yorkshire, England, to an American father, from Baytown, Texas, and an English mother, from Hessle, Yorkshire. The family settled in Spring, Texas. 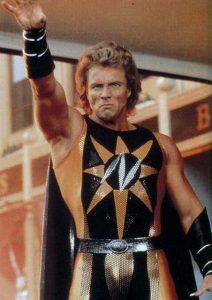 Finding early employment as a member of The Chippendales in Los Angeles, that physique and luxurious mullet were eventually put to good use when he was cast as Nuclear Man in the 1987 film, Superman IV: The Quest For Peace. With a look very much akin to Lex Luger as The Narcissist in the WWE, Pillow looked every inch the perfect physical specimen, produced by Lex Luthor using Superman’s DNA. Sadly his voice was overdubbed by Gene Hackman, so we never got to hear Mark’s villainous tones in full force, which to this day is a cinematic travesty. The superpowered smackdowns between the two belied the film’s meagre budget and poor execution, as Pillow and Reeve really strived to convey a sense of this being two beings that possess unlimited power, a perfect match for each other. As a young boy that was oblivious to the film’s overiding issues, I was thoroughly captivated by this seemingly unbeatable foe for Superman, a larger than life villain that served no greater agenda then the destruction of Superman and trying to win the hand of Lacy Warfield. His commitment to his character cannot be questioned either, see below picture of mark attending the Royal Gala Premier of the film in FULL COSTUME. I am sure Princess Diana couldn’t have failed to be overcome and awestruck at this sight. A comic book come to life and no mistake! 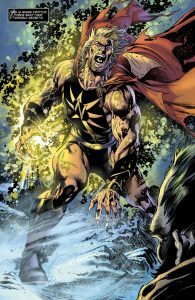 Speaking of comic books, the character was amazingly brought back to something resembling relevance this year on the pages of Brian Michael Bendis’ current run of Superman, as an inhabitant of the Phantom Zone, duelling (briefly) with the unstoppable Rogol Zaar. It is a testament to the enduring appeal of Mark’s performance that the character was taken out of mothballs for one last run. Still in possession of Superman’s tattered cape too! Perhaps adding to his mystique, Mark Pillow has fallen off the radar in recent years. His Twitter page (@MarkPillowNM) hasn’t had any activity on it since 2016, and he hasn’t received an acting credit since The Alaska Kid TV series in 1993. Having little or no presence on the Comic Con circuit too, it is a mystery to me as to what has become of the man. It would only be right for Mark Pillow to receive his place in the DC World Hall of Fame this year, vote here!